1st Editon 2013, 272 p.
Pre- and post-operative care of transplant patients is an aspect of Critical Care Medicine in which most ICU physicians and nurses have received little or no formal training and are left to cope with this complex population with only incomplete 'on-the-job experience' as a guide. In response to this clinical knowledge gap, ICU Care of Abdominal Organ Transplant Patients provides a concise bedside resource fo intensivists, surgeons, and nurses caring for abdominal organ transplant patients before and after surgery. In a concise, practical style, the authors offer concrete solutions to questions and situations confronted by ICU clinicians. 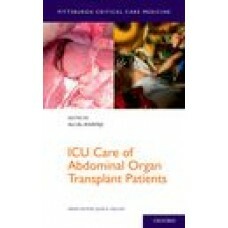 Chapters address general principles of immunosuppression, infectious complications, management, and nursing considerations, plus indications, approach to anesthesia, transplant procedure, and post-operative care for liver, kidney, pancreas, islet cell, and small bowel and multivisceral transplantation.